Sold by Amnesty International USA and Fulfilled by Amazon. Order within , and choose One-Day Shipping at checkout. The Complete Collection - "The Beatles Stereo Vinyl Box Set"
The Beatles are releasing their complete, newly remastered vinyl collection in The Beatles Stereo Vinyl Box Set. All of their classic records have been beautifully remastered using the most meticulous vinyl mastering processes. 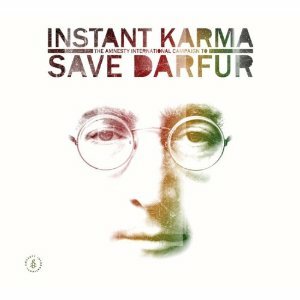 Featuring songs by the iconic John Lennon newly recorded by some of today's biggest as well as emerging music artists, Instant Karma: The Campaign To Save Darfur is the major benefit-album project of the year. The proceeds support Amnesty International and its campaign to focus attention and mobilize activism around the urgent catastrophe in Darfur, Sudan. Buy a CD, save a life. If there is a "must have" album out for the summer of 2007, this is it. What could be better then getting some great tunes and serving a worthy cause at the same time. Yoko Ono donated the rights to John Lennon's entire catalog for this release, and I think it's something he would have been proud of. John spoke in a interview once about going back are re-recording much of his material, because he was never quite happy with the productions. The recent remastering of his catalog gave us a taste of what that might have been like. Instant Karma takes it to another level. These are some of the most beautiful songs ever written, and if there was ever a questions on whether John Lennon's solo work equaled or surpassed what he did with the Beatles, this album answers it with a resounding YES. There are a few disappointment and a few pleasant surprises. U2's "Instant Karma" strays too far from the original by trying to replace the "wall of sound" piano with droning guitar. The Black Eyed Peas do a good enough version of "Power to the People", but I kept waiting for them to bust out with some of their brilliant ad-lib rap, but that never happens. Maybe they were just trying to respect the original song, but it left me wanting more. Jacob Dylan and Dhani Harrison compliment each other as well as their fathers did on "Gimme Some Truth". Christina Aguilera captures the angst of "Mother" with haunting precision, and Los Lonely Boys provide some of the best guitar work on the album's version of "Whatever gets You Through the Night". Corinne Bailey Rae provides a beautiful minimalist version of "I'm Losing You", and Green Day hit a home run with their almost too perfect cover of "Working Class Hero". One further point of contention: given the strength of Lennon's work, and the size of this two disk set. There was no reason to repeat any songs, yet we are given two versions of "Imagine" and two versions of "Gimme Some Truth". Yes, they are both great songs, but I would have preferred it if each artist did a different song. Someone out there should have come out with a post-metal, post-grunge version of John Lennon's "Meat City" which is one of the most powerful rockers of the 70's, bar-none. In fact nothing from the Mind Games album is represented here, leaving out some great songs. That all said, it is great to see these songs alive and well in the 21st century, where their message of hope and love have never been needed more. With 22 songs on the disc, you can't expect a home run every time. But there are some excellent covers on this album. U2's Instant Karma is this first song on the disc for a reason. Easily the best track. R.E.M. makes Dream #9 sound like an R.E.M. song. Green Day, Jack Johnson also rock solid. Aerosmith's "Give Peace a Chance" is a disaster. Overall, very worth the price, and its for a good cause. I haven't heard a better CD in a long time. I was a bit dubious, wondering how the various artists would cover these songs. But they all held true to the spirit, intensity and timeless messages of these songs. Listen to the samples here on Amazon. These are the types of songs we need now, the kind that urge people to act, to stop being indifferent, to IMAGINE (one of the songs) a world where things can be better. Plus, its for a good cause. Buy this one. It is that rare combination of good music created with purpose. So I bought the triple disc edition of this to great disappointment. Where's the track by a-ha? Josh Groban covered Imagine, which is on the extra 6-track CD that you recieve when you buy it using an AmEx card through the website http://www.instantkarma.org/imagine/. It's also available through iTunes. I'm actually waiting for someone to whine about Avril covering Imagine. How come no one mentions disc 3? The album comes in a variety of different promotional editions. Mine has two "hidden" tracks: "Imagine" performed by Willie Nelson and "Happy Christmas (War Is Over)" performed by Maroon 5. Great music from 70s radio!! : A list by C. Upperstrom "dj-diezman"
Have A Fundamental John Lennon Collection: A guide by Mike King "Mike Vegas King"